Built 1955 by Bertel Liljeqvist and Sam Salvesen, to replace a previous theatre (built 1868, destroyed by fire in 1953). 1997-1998 renovations. The building includes three halls: the main theatre "Stora Scen" (272 seats) and two studio theatres: "Studioscen" (80-120 seats) and "Vasallen-scen" (62 seats). Used for theatre performances in Swedish. 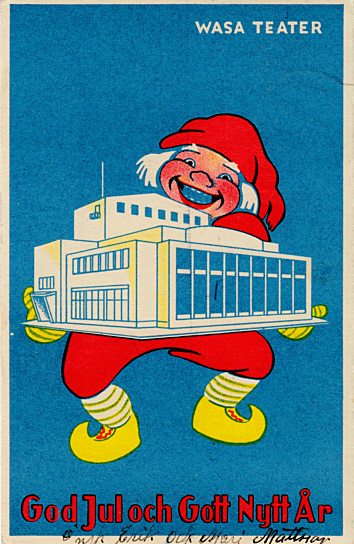 Front Text: "Wasa Teater", "God Jul och Gott Nytt År"